The Adventures of Tom Sawyer is Volume 8 of the Gabriel Wells Definitive Edition of Mark Twain's works. The Appreciation was written by Booth Tarkington. Tarkington was a native of Indiana. He attended Purdue University before transferring to Princeton where he enrolled as a special student -- not having the prerequisite courses in classical languages to qualify for graduation. At Princeton he edited the Nassau Literary Magazine, a humor magazine called Tiger, and the school yearbook. Tarkington was a member of the informal Princeton Coffee House literary club that championed writers such as Mark Twain. In 1893 Tarkington began writing his first novel The Gentleman from Indiana. The novel was later serialized by McClure's Magazine beginning in May 1899 after Hamlin Garland read the manuscript for McClure's and gave it a positive appraisal. (Garland wrote the "Appreciation" for Gabriel Wells Definitive Edition of Roughing It.) 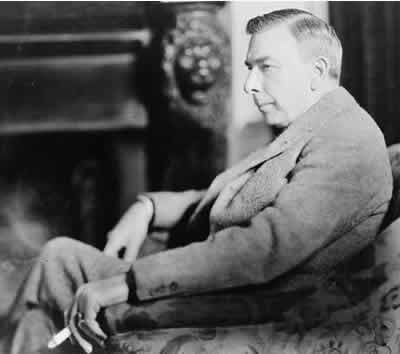 The subsequent publication of The Gentleman from Indiana in book format brought Tarkington to national attention when it made monthly best-seller lists twice in 1900. I seldom read Christmas stories, but this very beautiful. It has made me cry. I want you to read it. ... Tarkington has the true touch, ... his work always satisfies me. (Paine, p. 1535). In 1914 Tarkington wrote Penrod, followed in 1916 by Penrod and Sam. Both books follow the adventures of an eleven-year-old boy growing up in the Midwest. Both books have been favorably compared to Mark Twain's The Adventures of Tom Sawyer. In 1919 Tarkington was awarded the Pulitzer Prize for The Magnificent Ambersons, a novel also set in the Midwest after the Civil War. In 1922 Tarkington won his second Pulitzer for Alice Adams, a story set in the Midwest after World War I. By 1922, Booth Tarkington was a highly regarded writer of American literature and well qualified to write the "Appreciation" for Mark Twain's The Adventures of Tom Sawyer. THIRTY or more years ago there appeared in public prints a debate, not unfriendly, between two preeminent writers; one the foremost English romanticist of his generation, the other a realist of unique distinction. The realist objected to romance on the ground that it was false; and, in effect, he said: "Your art isn't a true one. You get people to read your books by entertaining them with suspensive plot -- a low sort of business for you to be in, anyhow -- but, as if that weren't enough, you entertain them with what is incredible. That is to say, the 'characters' in your books have 'adventures': you most obviously make up both impossible dangers and impossible escapes for them. To crown all, you write stories of pirates!" The romanticist inquired: "Well, why shouldn't I write stories of pirates?" The realist replied: ''Because to write of anything so unusual as a pirate is to represent what virtually doesn't exist. The novelist is to write of what exists and to try to reveal its meaning. Obviously it follows that when he writes of anything so unusual as to be nonexistent (that is to say, one of your 'pirates,' my friend!) he is revealing nothing: he is only trying to get paid for talking nonsense to excite childish minds." The romanticist asked another question: "You say that writing of pirates is false art because pirates are unusual; but are you sure that they are unusual?" The realist replied: "I am not a pirate, myself: neither are you. I have no relatives or friends or acquaintances who are pirates: neither have you. I have had no ancestors who were pirates: neither have you. I have never seen a pirate: neither have you. I have never seen anybody who has seen a pirate: neither have you. I have never seen anybody who has seen anybody who has seen a pirate: neither have you!" Then the romanticist said: "I was waiting for you to say that. It seems to be a mistake, because I have been a pirate myself, and so has every man I know. In fact, my dear old fellow, you have been a pirate yourself." The realist was indignant. "You say that you have been a pirate?" he inquired, with some little asperity. "And also that I have been a pirate? Well, dismissing for the moment your absurd statement that every man of your acquaintance has at some time in his career followed the profession of piracy, I shall ask you to be so kind as to tell me, please, just when you and I were pirates." "When we were boys!" said the romanticist.
. . . Tom Sawyer himself is a romanticist, of course; and so was the author of his being, at the time Tom was created. Tom is all the more a "real boy" for being a romanticist, but his adventures are not real; they are romance, which is only to say that Mark Twain permitted him to have, not just the adventures a boy does have, but the adventures a boy would like to have. The author pictured as actual the adventures the boy had in his imagination -- but not all of them. And just here we touch upon what is the craftiest craftsmanship in the composition of this book; a maneuver so adroit that it was probably not deliberately planned as a maneuver at all. Tom's imagination is shown to be so frequently occupied with grandiose adventurous triumphs, which do not "come true," that the reader is made ready to accept those lesser yet almost incredible ones that are represented as actually happening. Of course this is not to say that none of Tom's adventures could have happened to a boy. Any of them might, but not all of them would have happened to one boy; and perhaps we get just there a hint concerning the nature of what we call romance. Tom Sawyer was the first printed story of a boy in which the hero was recognizable as a boy throughout the whole narrative. It is true that (especially after the age of eleven) boys have moments when their thinking is not distinguishable from that of adults, but, until Tom Sawyer was written, nearly all the boys of fiction were adults with a lisp, or saintly infants, or mischievous eccentrics, or merely the sturdy "young gentlemen" who fought with the village "butcher's boy" before going to Eton, in the English novels. Here and there, particularly in the work of Charles Dickens, there had been hints of boys that were boys; but Tom was the first fullblown boy in all fiction. For this alone the book is a "landmark." But that is only part of its merit, to have been a pioneer. It has in it the quality of imperishable youth that was in Mark Twain, himself; and it led him on to Huckleberry Finn. Huckleberry fascinated Mark Twain from the moment when the priceless outcast appeared in Tom Sawyer, and yet the author contrived to keep Tom the dominant figure in the earlier book. Tom is not quite himself when he comes into the latter part of Huckleberry Finn -- those lively final episodes that are almost touched with opera bouffe, indeed -- but Tom is ever Tom in this, his own book. And how can we measure the joy this book has given and will go on giving? If happiness were a liquid and if we measured the reward of every person who reads Tom Sawyer at a bucketful, there would be a navigable lake of it by this time, and some day the lake will be an ocean. Decade after decade, the book goes on and on, until now we must almost say it goes on from generation to generation. Certainly that is where it is going. MARK TWAIN often found his pleasure, as well as his profit, in writing and elaborating his personal history. Nearly all of his earlier writing was autobiographical: he worked backward, beginning with his latest adventures in The Innocents Abroad, continuing through the immediately preceding period, the Roughing It days, passing for the time his river-piloting days to tell the story of his childhood. In his brief preface to The Adventures of Tom Sawyer the author tells us that most of the adventures recorded really occurred. Also, that Huck Finn is drawn from life, and Tom Sawyer. The latter, he says, is not from an individual, but from "a combination of the characteristics of three boys whom I knew." Huck Finn in life was Tom Blankenship -- in this book being neither elaborated nor glorified. The three boys who served as models for Tom Sawyer were, Sam Clemens himself, chiefly, and, in a lesser degree, John Briggs and Will Bowen, his jolly companions and fellow pirates. John Briggs was also the original of Joe Harper in the book. Samuel Clemens's brother Henry became Sid, though Henry was in every way a finer character than Sid. He was a lovable, obedient little fellow, whom the mischievous Sam delighted in teasing, though he always loved him, and fought for him oftener than with him. The young lad later followed his brother to the river, and died in a steamboat wreck, as told in the Mississippi book. Mark Twain's mother, Jane Clemens, was the Aunt Polly of Tom Sawyer, and his sister Pamela in the book is the gentle, loving Cousin Mary. Much of the book is very good history. The home incidents, most of them, really happened. Sam Clemens did clod Henry for getting him into trouble about the colored thread with which he sewed his shirt when he came home from swimming; he did inveigle a lot of boys into whitewashing a fence for him; he did give pain-killer to Peter, the cat. There had been a cholera scare that year, and pain-killer was regarded as a preventive. Sam had been advised to take it liberally, and was willing to share benefits with Peter. As for escaping punishment for his misdeeds in the manner described in the book, this was a daily matter, and the methods adapted themselves to the conditions. The true name of Becky Thatcher was Laura Hawkins, Mark Twain's favorite girl playmate and school-boy sweetheart. Indian Joe was likewise a real character. I have been writing fifty pages of manuscript a day, on the average, for some time now, on a book (a story), and consequently so wrapped up in it, and dead to everything else, that I have fallen mighty short in letter-writing. ... On hot days I spread the study wide open, anchor my papers down with brick-bats, and write in the midst of the hurricane, clothed in the same thin linen we make shirts of. He finished about half the story that summer, and laid it away for a year, or at least until the following spring, when the interest in it suddenly revived. This was in the Hartford home, and there early in July, under full head of steam, he brought the story to a close. He sent it to William Dean Howells, his literary mentor, stating that it was not really a book for boys, but for adults, such being then his conviction. But Howells disagreed. He declared it to be altogether the best boy book he had ever read, and strongly advised that it be offered explicitly as a boy's story. Viewed in the light of later events, there has seldom been any better literary opinion than that -- none that has been more fully justified. From every point of view it is a masterpiece, this picture of boys' life in a little, lazy, drowsy town, with the irresponsibility and general disreputability of boy character, which includes as well the latent instinct of boy manliness. As for the story itself, the narrative of it, it is pure delight. The pirate camp on the island is simply boy heaven. Tom's night visit home; the graveyard scene, with the murder of Dr. Robinson, the adventures of Tom and Becky in the cave -- these are all wonderfully invented. If, to the critical and hardened reader, the tale seems a shade overdone here and there, a trifle extravagant in its delineations, let him go back to his first long-ago reading of it, and see if he recalls anything but his perfect joy in it then. Tom Sawyer was immediately successful, and has ranked in popularity with Roughing It. Its sales, go steadily on from year to year, and are likely to continue so long as boys and girls do not change and men and women remember. 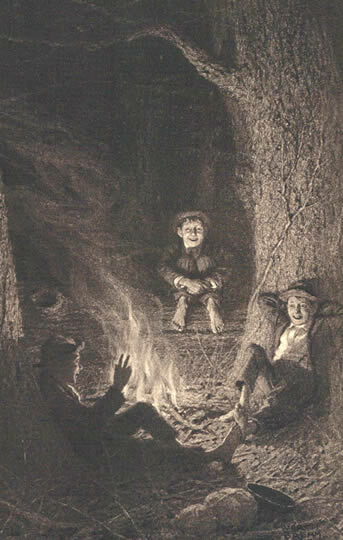 The frontispiece for the Gabriel Wells Definitive Edition of The Adventures of Tom Sawyer is an illustration by Worth Brehm (b. 1883 - d. 1928) titled "The Pirates." The illustration was first used by Harper and Brothers in a 1910 holiday edition of Tom Sawyer which featured sixteen of Brehm's illustrations. Brehm, like Tarkington, was a native of Indiana. Brehm was educated at DePauw University, the Herron Institute art school in Indianapolis, the Chicago Art Institute, and the Art Students League of New York. Brehm also illustrated Tarkington's Penrod and Sam in 1916. Brehm's "The Pirates" is a fitting frontispiece alongside Tarkington's Appreciation which focuses on the pirate theme in Tom Sawyer. "The Pirates" by Worth Brehm is the frontispiece for the Gabriel Wells Definitive Edition of The Adventures of Tom Sawyer. Other illustrations for the Gabriel Wells Definitive Edition of The Adventures of Tom Sawyer are those drawn by John George Brown that were featured in the 1899 uniform edition published by American Publishing Company. Banta, Ray. Indiana's Laughmakers. (PennUltimate Press, 1990). Paine, Albert Bigelow. Mark Twain: A Biography. (Harper and Brothers, 1912). Woodress, James. Booth Tarkington: Gentleman from Indiana. (J. B. Lippincott Company, 1955). "Worth Brehm Dies," The New York Times, 29 November 1928, p. 27.